A python hunter made a record-setting catch earlier this week when he caught a 17-foot, 5-inch female Burmese python while hunting in Miami-Dade County, South Florida Water Management District said. Kyle Penniston, of Homestead, made the solo catch Monday night while hunting on SFWMD land for the Python Elimination Program, SFWMD said. 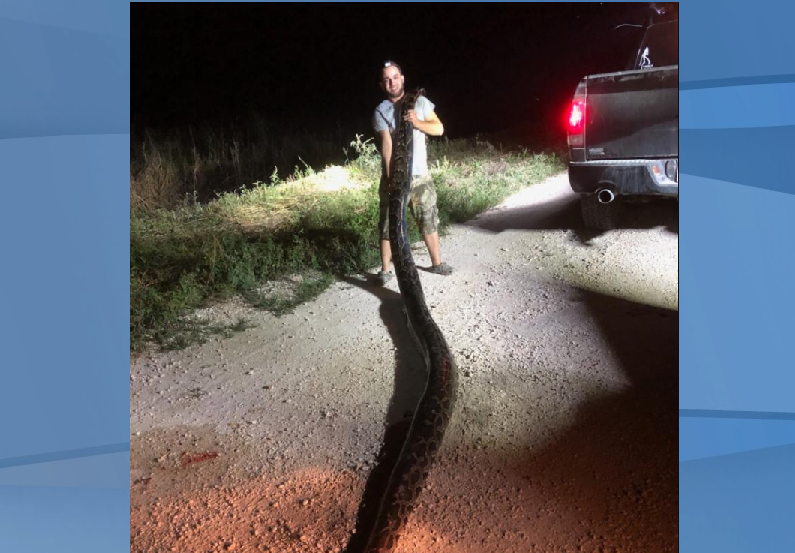 The 17-foot, 5-inch snake weighed in at 120 pounds, and it is the third caught as part of the program that measured more than 17 feet. I wouldn't want to trip over that in the dark ! Do you really catch one of those monsters or just shoot them. That'll make a few nice wallets. swamper2 wrote: Do you really catch one of those monsters or just shoot them. From the videos I've seen, they normally have to pull them out of the bushes, grab them by the head and put them down. I would like to see that. Are the videos published anywhere? Is that a 1250x33x15 tire print around the guys knee cap in the pic of it? Big one, no doubt but the pic is just off thinking this is a live catch by hand, alone. Prototype wrote: Is that a 1250x33x15 tire print around the guys knee cap in the pic of it?